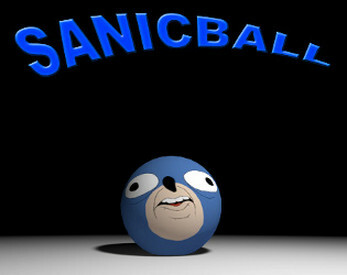 Sanicball is a stupid, silly racing game that throws away complex gameplay mechanics, character progression and microtransactions in favor of pure fast. It features the all the latest* dumb internet memes thrown together in a blender to form a truly europhoic circlejerking experience. This wasn't the original intention but it ended up happening anyway. I am no longer working on the game. If you have any questions, send them to me at http://sanicball.tumblr.com/ask, or shoot a good ol hate mail towards viciousbadger@protonmail.com . This game is purely fan made, Sega or Sonic Team were not involved in creating this. Also, 'Sanic Team' and 'Notsega' are fictional companies. Sorry about the lack of screenshots, I will be adding some eventually! (I'm lazy.) Meanwhile you could always watch one of the (very) many youtube letsplays of the game to get an idea of what it plays like.